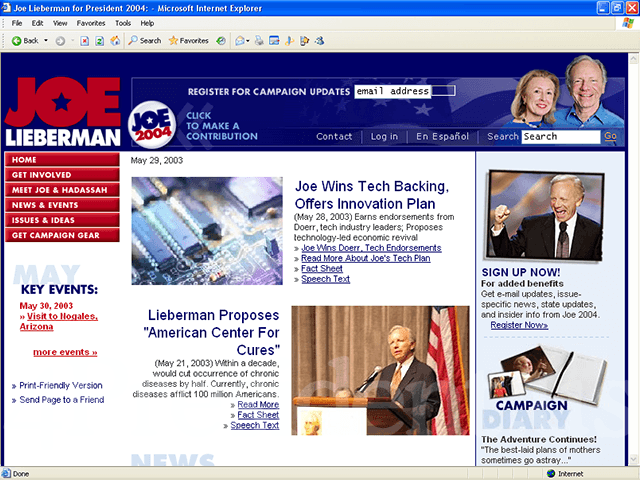 ARLINGTON, VA Joe 2004 relaunched its campaign website today at http://www.joe2004.com/, with the new site featuring a campaign trail diary from Joe and Hadassah Lieberman, personalized news based on users' interests, and a number of tools to organize Lieberman supporters at the grassroots level. The new joe2004.com gives visitors an up-close-and-personal look at a national presidential campaign by featuring regular campaign trail e-mail updates from Joe and Hadassah, as well as photographs from campaign stops across the country. The site also features a Lieberman Family Photo Album with historical photographs. By registering at joe2004.com, visitors will be able to receive e-mail on their individual areas of interest, and personalize their websurfing experience on future visits to the site. Supporters can also sign up for LieberNotes, a regular e-mail update on the latest news from Joe 2004. The site also features a number of other tools, including a Spanish language section featuring the latest campaign news; a calendar of upcoming campaign events; information on Lieberman's record of being tough on defense, strong on the economy, and socially progressive; and details on Lieberman's policy proposals on key issues facing the country.